With the view of goal-directed search for materials with required value of thermal expansion coefficient a generalized expression for approximate estimation of the coefficient of thermal linear expansion of solid crystalline dielectrics at temperatures above the Debye temperature is obtained. It is shown based on the example of rare-earth magnesium hexaaluminates that the calculations by these expressions well agree with experimental quantities. For these compounds an expression for evaluation in the first approximation of the value of internal energy of crystal lattice was also obtained. Original Russian Text © A.V. Yeganyan, A.S. Kuzanyan, V.S. 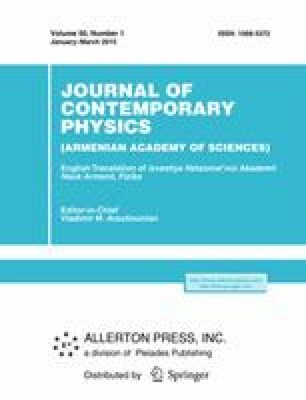 Statopoulos, 2015, published in Izvestiya NAN Armenii, Fizika, 2015, Vol. 50, No. 1, pp. 105–110. An erratum to this article can be found at http://dx.doi.org/10.3103/S1068337215020176.